I1'1;E1A\I ()F PLANT IN H'STIl Y ('iicllhir No. :Vi. Ill VlTll-l (! TlE AT (1T!W. A(! ;I()N()ONll,~'r IN ('0 1AI (G ,] OF ( )AT I N1 KS'll.\IlIl\,. "T.M1 I ( 'ir. :Ii> i>'. Ill' I1: V OF PLANT INDUSTRY. C'hi, [ Of olfB ni. B]VERL'. 'I. (;A.L(WAY. AI S.'4,1t t ('hiCi of BflUIaI. ARI.ERT F. WOODS. I'l, itol, ,1. E. ;, II)('K Iv II..
Clhicf ClI 'rk, J[AMIE.S I'. .JONES. tf cu' 'lin il 1ho I ;isl t i 'ol yuals: a;1"i"!l t I ;i]>el i'I ta lb en tilhfd W\vith s!i.'es. p+ tl~t'l liis !,ircit Itr+ciialm +l. fIflut s liu rf ''f ,iln uiall. 11MPLPOVEMENT OF TF E OAT ('hOP. LINES ALONG WHICH IMPROVEMENT CAN BE EFFECTED. to hull is desirable, and this may vbe made thlie basis of selection. 1ld:mt or head selection, aind l hybridization. 1M IA N lI. i. SELECTION. improvement of thle variety results from these methods of selection. turns. This can be accomplished only by hand selection. IN'T1IIt)1 (l'(1(N 1' NE\V SiEED). ducv(I b' thlie Iinited Stales Department of Agriculture, and Klier. sonl. iintrodul ed Itv (i1e (I Ne a iska A-ricillllnral lExlpelrimtelnlt ,Staltionl. diIin cIe, e n ] \ ,(ih r ih oi1 'i- i Il f s lo c IIi i lic a iIie. A t t IniiirI loI. I re; o1 1W i I wk I I'I I,,WVt. invol e- a r e \v li lie aiil ex|)ell. I Itie IIs IoI Ilie smalIol wed pla . ,1,, ll lie I :t Id a Ifo r I lie l t loviii ll- a t n i I a i l qt'l'or i( i liar\'e-'Il(' . iieai' \' asI IV l- I ,t Io IIe t \'je. : I lv (. ()iil- \\liirh/i -lio>\\ sYIftetrf ioi"
I.\l1l(iVt 1 l:( V I, (IV 1 11l ()A\T ( 1No 1. IAJPno\V'-M\KNT (IF TilE )OAT 1CROP. ratio of size of the small plat to the a ,' i. "'- of the general crop. on a small scale without ri-kin-" llit (t'iiire crop. Frequently. too,. is t1hs imale a nieces-ityV. IN1IiVI 11)1 I 1 P ANT SEI.I':CTION. periment ,Sli;i(m Bullelin 251, ppI. 318-319. I. \l 'lic\VK.MI K."l ~il. *il l ( I,\ i~ ilI. narrow ~~ ~ ~ C--/ ^pc bgen h TI..as _.
shIlT() Vn II e dlcia i'aIii tyi. i'1 I1 f ... ..
ti olin ti it |l' h t x l th i li, oiu ti > oi 't ..-r-** -*- - -. . .. .
have prodcmi ed e ou + -eed for (wod I.. 1\~\.. .
-+e\Ver l row- of IIIY parti lular -trail .. .......... ..
-liould lbe phlailed In dillorelii p)art~- -- ---- "
hia r \+e ti~l +, a n d~ w\e i +lliin p-. I ;,.. .. 1T 1'1'" -"i",'1" ""
i- >riIl. i. i;( f'o o e+ oI tile-c 174ITf'ovlo' -. A t li;,rve' -(t 1i1 1,' illt' [I;:l! retaie(,1 l E:,,cl rov -liwild then he harve-ted, tlhra.-hd. anld w\+ jl .1. 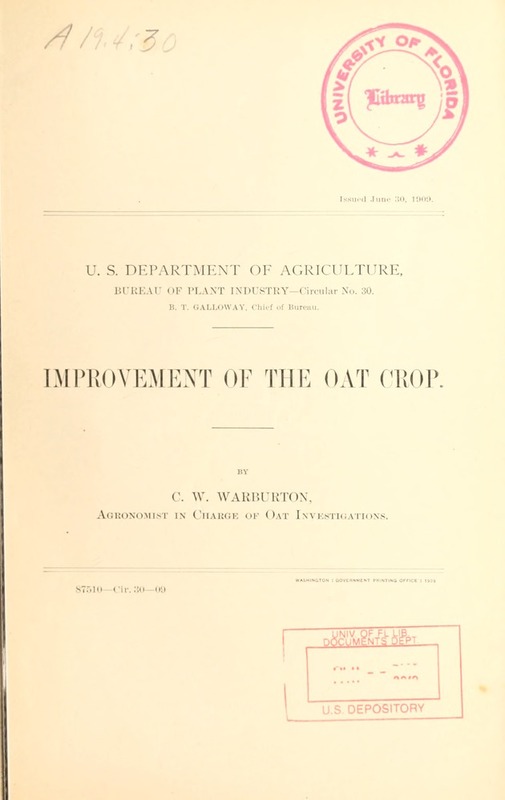 IMPIliOVEMENTr OF THiLE OAT ('ROP. it, to prevent confusion with other varieties. IAI PR 2\ovi XI 1 I' 1 ll L AT I e ll'. Ix.i". T1ii".. we iuiv ha ve W T Silvrindi 1. Si el'rn" w "2. itn.. wr 1 1.
that vareti' v. Sele',1ti ,t. f va Xi eb'1 No. "2 wXXl hi e 1 I lllill ,'red 2' 1,.
u zlwthi l (l, ;i t t -t i irry sttorc . It\ '' Tl]e 1untik 21i, -r X Nor. t 2. \NO. :' etin. 2or .li 21 'IH;112t'e..
1MI'WOVI KME\ItNT OF THIE O)AT ('ROP. For fill sowilig ill tho South: AVirgiia (Ony mtid hardy strains of' 10islproof. For spring. sow\ving, in the South: Burt. huist proof. I)i:,v Khe(rson. Silvermille, .Jo illellette. Early ('l niip0oii. Silx'iiiii. Sixty-D ay, White Iussianii, Lig[owo. Big Four. iient imay be alont" the lines of disease resistance, strenpi(h of straw. rainsis to the professional breeder. 1'(*rctany of A yr't/ii ,, ii'. WV.\ sIN (.TON. I). (C., .1A 'i 2,, 190,)9.